Puyo Puyo Tetris is almost a perfect puzzle game. It’s full of content with tons of game modes for solo, local multiplayer, and online play. It has an appealing presentation. 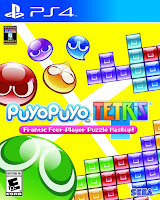 And, oh by the way, it features fantastic versions of not just one but two of the undisputed kings of the puzzle game genre in Tetris and Puyo Puyo and even mashes them together in one particularly chaotic mode. The best part is you get all of this for just $30 on PS4. This is the steal of the century and a must buy for puzzle fans. See all of the details here in our full Puyo Puyo Tetris review. 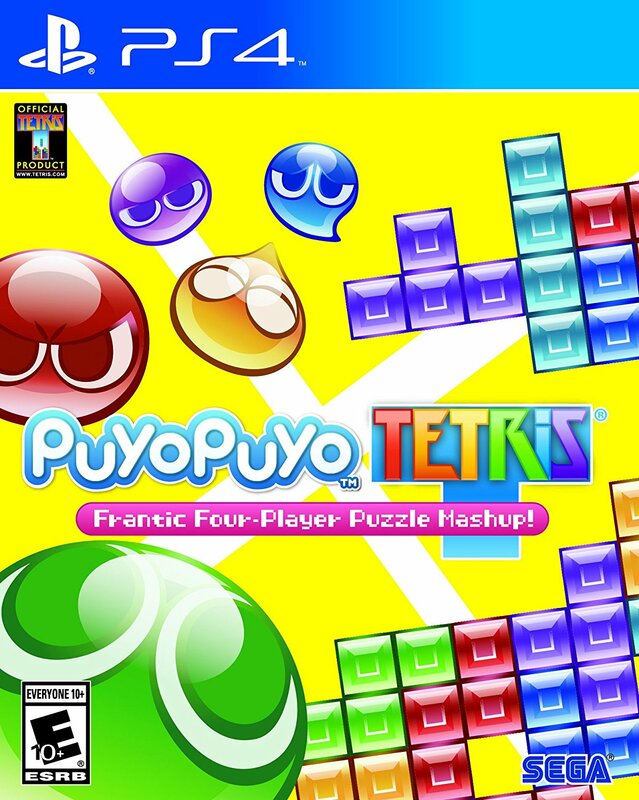 Puyo Puyo Tetris is, simply put, a game that combines both Puyo Puyo and Tetris into one game. Both Puyo Puyo as well as Tetris are available to play in a wide number of modes that task you with completing specific challenges or play in marathon modes, as well as a bunch of multiplayer versus modes either against A.I., in local multiplayer, or online. There is also a story-based adventure mode as well where you play through a long series of stages while a nonsensical story full of odd characters (I guess they’re Puyo Puyo series mainstays in Japan?) with bad voice acting prattle on about nothing. I preferred the stick to the other modes. What makes the game truly special is when it mashes the two distinct styles of puzzle games together. 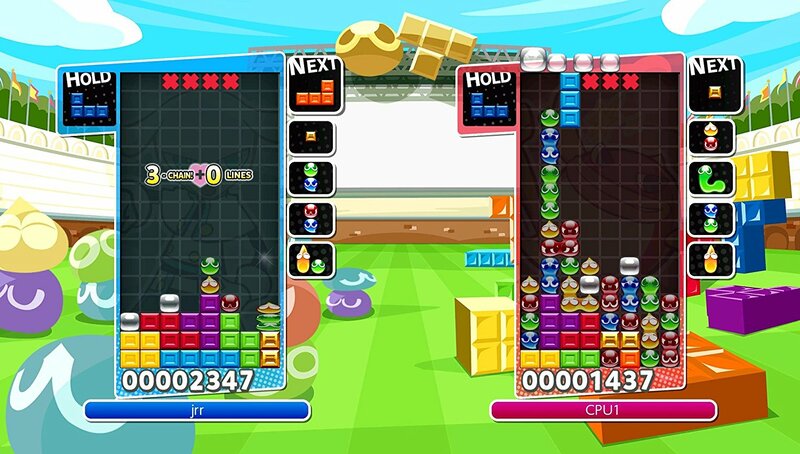 Swap mode has you playing separate Tetris and Puyo Puyo boards that switch out every thirty seconds or so, which is very interesting as it forces you to play and think pretty differently depending on which game is active. 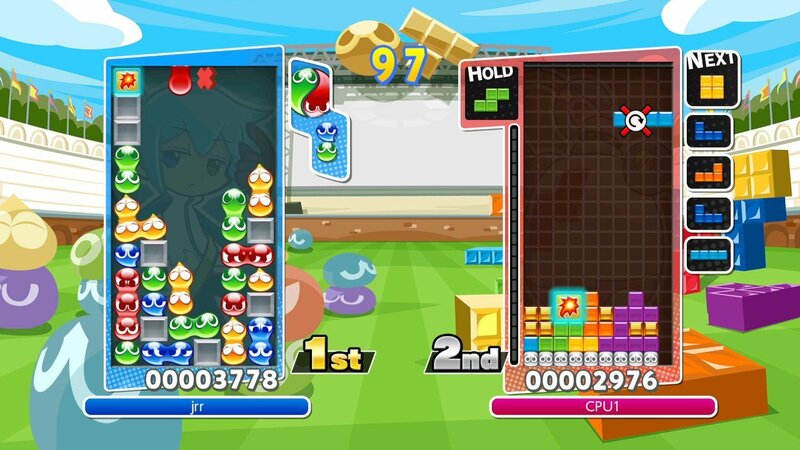 Fusion mode ramps things up even more by having both Tetris pieces and Puyo blobs (?) on the same board. The basic rules are the same in Fusion mode – make solid horizontal lines of Tetris blocks or match four or more of the same color of Puyos to clear them – but having to do them both on one board at the same time is totally fresh and unique and utter madness. While the game does have a robust selection of single player modes and content available, it was definitely made with versus modes mind. Playing against the A.I. or in local or online multiplayer is a ton of fun and because of the sheer amount of options and modes and configurations available, there is a lot of variety, too, which make it a solid party game. I will say, however, that despite being fairly simple to actually play, Puyo Puyo and Tetris both have incredibly high skill ceilings and multiplayer versus matches can get out of hand pretty quickly if the skill levels of the players involved aren’t evenly matched. Bump up the A.I. difficulty a bit or dare to step into an online match and you’ll be humbled pretty quickly even if you think you’re a Tetris or Puyo master. This isn’t a knock on the game, and in fact it’s all the more reason to keep playing and learn to get better, but it’s something to consider. I’m afraid I can’t speak with any authority on Puyo Puyo (sorry), but I do have some comments on the version of Tetris included here. This is the modern style of Tetris with the ability to hold a block for later use, infinite spins to keep a piece in play until you get it where you want it, and T-spins where you can rotate a piece into a hole it shouldn’t fit into. Personally, I kind of prefer the oldschool simpler Tetris from the NES or Game Boy, but these days Tetris fans can’t be too choosy because there simply aren’t very many good Tetris games available on consoles anymore. With that in mind, Puyo Puyo Tetris is pretty easily the best version of Tetris available on consoles right now, so Tetris fans looking for their fix can pick it up with confidence. Presentation wise, Puyo Puyo Tetris looks nice overall. The menus are easy to navigate and the gameplay screens are fairly clean and easy to see what is going on whether you’re playing Tetris, Puyo Puyo, or the fusion of both of them. The sound is also simple and clean, outside of the iffy voice acting, and the music is generally quite good overall. All in all, Puyo Puyo Tetris is probably the best classic puzzle game on PS4 (and Nintendo Switch for $10 more …) and is well worth a look for fans of the genre. It provides great versions of Puyo Puyo as well as Tetris with tons of variations and modes for each and a wide range of versus multiplayer modes for almost limitless replay value. For both solo and multiplayer play, you really can’t get a better and more fully featured puzzle game. Buy it.